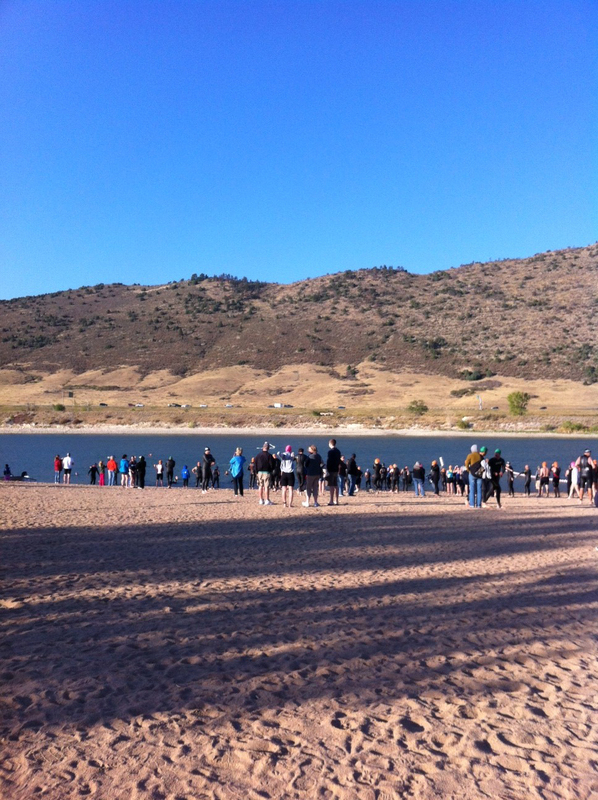 Last triathlon of the year - and the bonus was that it was in Bear Creek park. The entry to the park is only a mile from my house, and the start at the lake was only another 3mi into the park. Perfect pre-race bike warm-up - although riding a TT bike with a 20lb transition pack feels a bit sketch on the downhills into the park! Swim: So I've been REALLY working hard on my swim over the past few months. Lessons, stroke analysis, skills work, masters and of course open water. All paid off. While I'm not blazing fast, I've gotten pretty comfortable at least at *being* in the water. And my biggest fear going into my first open water swim was the 'washing machine' that is a mass swim start. 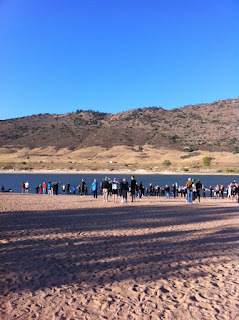 But by the time this race rolled around, I felt really great about the open water swim and even the mass start. I had zero anxiety about it and was really looking forward to it in fact. Standing there on the beach in my wetsuit, I felt like I had done the work to belong there. We were all laughing and joking about the start. The water was a bit nippy (72 degrees), and the air temp was even cooler (about 64 F). After warming up in the water I was standing on the beach and my teeth were chattering. But once I got swimming, it was perfect temperature all through the race. The other funny thing was that due to the end of season drought and Denver Water pumping out the reservoir, it had exposed about 50ft of beach. So the entry and exit was on these big slippery rocks that necessitated a water start - and some careful footing on the exit. I was in the second wave, so sighting was helped because I could see the splashing of the first wave out near the first turn when the siren went off. There was a little bumping and such, but it wasn't too bad and I could just move into clearer water pretty easily. I held on pretty well to the lead pack, but then realized I was going way too fast and I had to let up and breast stroke a bit to get my breath back. From there on out it was a combination of decent freestyle pace and taking a couple backstrokes or breast-strokes to recover. I still swim way too fast in open water and end up getting out of breath. But pacing is coming along. On the last turn I was able to speed up a bit and was just starting to find my pace, but by then we were bunching up a bit again to exit the water and run up the beach to T1. My T1 went pretty well, although I still struggle with getting my wetsuit to clear my big feet and also need to get some tri shoes so I can set up a flying mount, instead of struggling with my road bike shoes. I did notice that he faded ever so slightly on each of the steady climbs (nothing in Colorado is flat) and on the last climb I finally passed him pretty strongly and tried to put some distance on him. But then this truck turned in front of me and I got blocked for a bit (string of slow moving riders on the right). I yelled out, "C'mon!" and the driver waved me to pass on his left. But still, it messed up my ability to gap the guy and we both entered transition just about the same time. Good flying dismount and smooth T2 (although I had to spend an extra 10 seconds to fix the bike rack that had folded back up when one of the other riders had pulled their bikes out. Run: Out on the run and I just kept working on winding my feet up. I didn't see the guy I was chasing and figured he was slower out of T2. Now I just started picking up pace and picking more people off that had burned a bit too many matches on the bike. I especially liked the hills on that run because I run that park ALL the time and know the topology of the whole run course like the back of my hand. Every roll and drop - I knew where I could spin up and recover. It was an out and back, and on the final climb to the turn-around, I could hear someone slowly bearing down on me. As they got closer, I could just tell it sounded like a woman, so I stopped worrying too much - turns out I she was the top AG women finisher. She passed me on the turn-around and we exchanged 'nice work' as I tried to pace behind her. Finally, with about a mile to go, I saw the guy I had been chasing on the bike. Crap, that means he left T2 'ahead' of me! I was making time on him and tried to stay quiet, but he looked back and started to speed up a bit. The gap (about 13 seconds) held until the finish. I just couldn't close it, although we both had picked up the pace and were now passing a few 30-39 year olds in the closing mile. With 1/4 mile to go, I knew I couldn't kick to close that gap because he would just kick as well. I looked back - nobody in sight. Time to cruise in. He and I talked afterwards. Really great guy. We both exchanged thanks because we knew we had each pushed each other on the course. Turns out he was from San Antonio. He had actually ridden in his running shoes and didn't have to mess with a collapsing rack. We had nearly identical splits (I actually was slightly faster on the bike and run overall) but his transitions, especially T2 was where I lost that position. He ended up being 3rd in our AG with me like 13s behind him. Ahhhh well. We both also had similar backgrounds, although he was more of a runner. I can't say enough about how nice a guy he was and how fun it was to share perspectives and thoughts on the cat & mouse throughout the race. I ended up 4th in my AG and 20th overall (including the 6 elite men ahead of me). Not shabby although I beat myself up for losing a podium spot in transition. Then again - that's a painless problem to fix for next season! My biggest area of improvement continues to be the swim. I came out of the water 4 minutes behind the number one guy in my AG. That's pretty tough to make up over just a 20K bike and 5K run. But over the winter, I think I can knock at least a couple minutes off my sprint distance swim time with some good attention to that. I also think that with some attention to my bike (I really did just some cursory bike training this season and rested heavily on my run fitness and laurels of past riding) - I think I can bump that up by quite a bit and make it a real strength again. Also need to work on being able to put out power and keep my bike handling smooth while in the TT position. Throw some decent race wheels in that mix and I feel pretty good about my splits - especially in the longer races (Olympic and 70.3) on next season's agenda. Post race: I actually didn't hang around for awards because Luke's 5th birthday party started at 11am. We did a big Star Wars theme party for him and about 15 of his friends. Paige and I put a lot into it including some great decorations and her dressed as Princess Amadala and me as - well who else? Darth Vader! (Luke's mother and father for those of you not in the Star Wars 'know'). The kids loved the guest appearance of Darth Vader. Although two things - you 'cook' in that costume in the hot sun (as well as fog up the full helmet eyes). And '2' - when a kid pummels your helmet from behind with a light saber (that we made from pool noodles and black duct tape) - it echoes pretty loud in that helmet!! Needless to stay, Luke and I took a nap mid-day once the party was a success and in the bag!! This race is under new management this year (Racing Underground - who are awesome btw). The bike course is changed - a bit more hills. Best advice is to check out the course map and go ride it. The hills are really not bad - although that's relative I know. The run course is about the same. Slight climb out, slight descent back.